I'm not a fan of those shirts/bumper stickers/whatevers that say things like this. I used to have a "Run to Eat" mentality. Running appealed to me because the fitness magazines of the time insisted that steady-state cardio was the best way to reduce fat. It burned calories, so I did it. The problem is that I was setting myself up for failure. Running long distances takes fuel and recovery. But if I ate more than "normal" I felt immensely guilty. Not helpful. A lot of competitive runners have an "Eat to Run" mentality, which is much better. They put a lot of time and effort into their diet, making sure they get the proper fuel and recovery they need for their training. 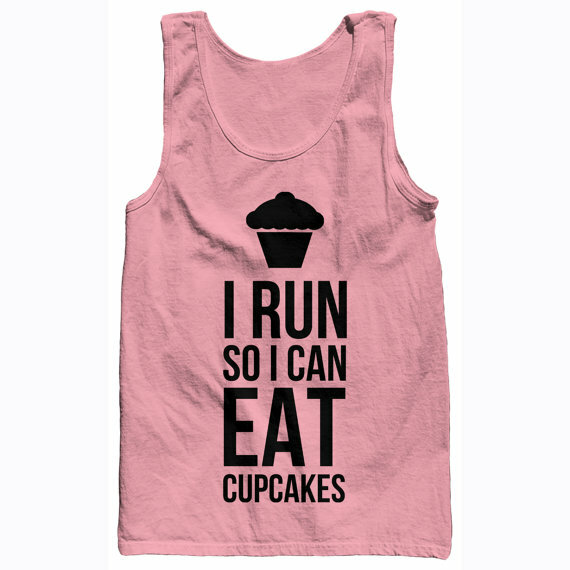 My running diet is much more simple than that. I am sure it's not as effective, but it works for me. You ready for it? It's the same as when I'm not training. I mean, it's not. I eat more. But my mentality is the same. I eat when I'm hungry. I honor my body's cues and I trust when it wants more or less. I've read about food and running a lot. And I understand the importance of recovery and fuel. So I do put a little bit of thought into what I consume immediately before, during and after a long run. I do drink a lot of water, a coffee for energy and a small snack with lots of protein and carbs that won't weigh me down. A protein shake or peanut butter toast are my go-tos. I don't carb load. I find this makes me feel heavy rather than provide energy. 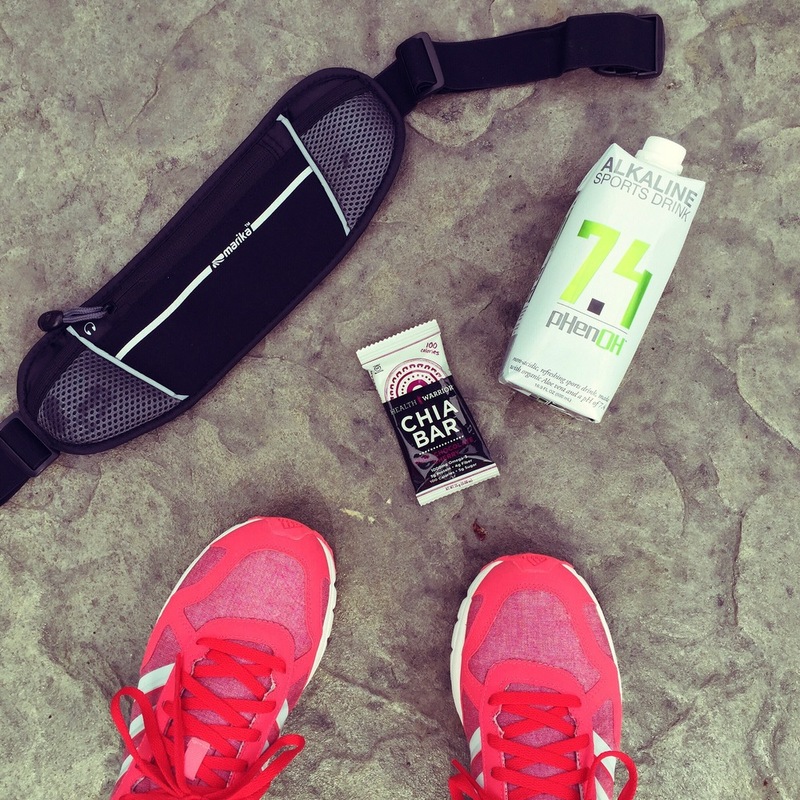 I do eat one of these Health Warrior chia bars around mile 7 for a boost in energy. I've also tried dates, which worked well but are a little messy and difficult to quickly consume. Oh, and I run with water — hydration is important! I don't do Gu. Have you looked at the ingredients? I'm not sure I want to eat that stuff. Also, it's called Gu. Not appealing to me. I do drink lots of water. And now, I'm a big fan on Phenoh! More on that in a minute. I don't reach for a sports drink. Or a cupcake. Or pizza. In fact, I don't eat more than usual until the day after the long run. My body isn't hungry yet and I don't want to force feed myself. That seems silly. The body is naturally alkaline and it must stay that way in order to function properly. Stress and exercise cause the production and buildup of acidic compounds in our blood, contributing to fatigue and negative health effects. The average diet today is overly acidic. Conventional sports drinks, besides being overloaded with simple sugars and chemicals, are also extremely acidic. At pH 7.4, Phenoh 7.4 is the first sports drink focused on balancing pH, using only the finest natural ingredients. Phenoh 7.4 helps to keep your body balanced and tastes great, too! The traditional "yogi" diet is into alkaline balance. It's good stuff. I don't really track it, but it is good stuff. This opportunity to try Phenoh came at a good time, because I'm getting into the longer runs of my half-marathon training. As I said before, I don't have sports drinks after my runs. I drink them every once in a while but it's because I want a yummy drink, not because of physical activity. But Phenoh is different. It isn't loaded with artificial ingredients. In fact, it only has seven ingredients, one of which is organic aloe vera. I used to drink aloe juice in shot form and can tell you that Phenoh is much tastier. Aloe is the magic ingredient that alkalizes the body. It's also great for digestion and helps boost the immune system. Overall I'm digging Phenoh. It tastes good and I can get behind the ingredients. If you're into sports drinks or are looking for a recovery drink, I recommend giving Phenoh a try! Disclaimer: I received a case of Phenoh and a small compensation to review through my partnership with Fit Approach as a Sweat Pink ambassador. All opinions are my own.